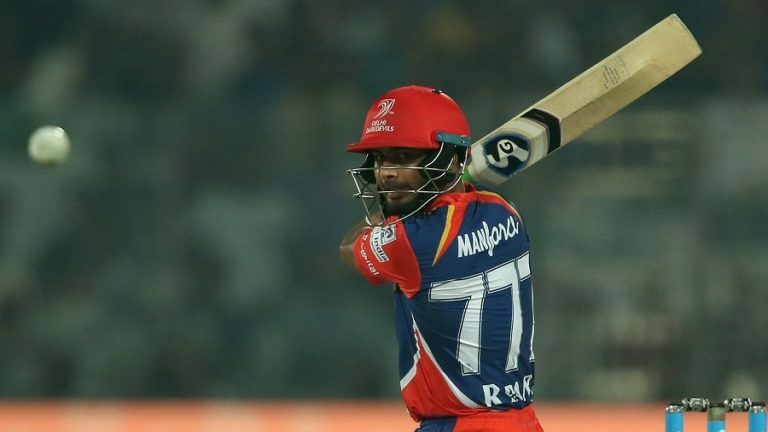 Rishabh Pant’s 43-ball 97 kept the Delhi Daredevils’ playoff chances alive, as they chased down 209 to beat the Gujarat Lions by seven wickets. It was do-or-die for the Gujarat Lions who needed to win all of their remaining games to keep their playoff spot alive and despite posting a massive target of 209, still managed to concede the highest run-chase at The Feroz Shah Kotla in Delhi and the second-highest run chase in IPL history. A complete massacre from 19-year-old Pant and 22-year-old Sanju Samson, who scored a partnership of 143 off 63 balls, helped set up a comfortable win for the Delhi Daredevils, taking their head-to-head to 2-1 in favour of the home side. After losing the toss, the Lions got off to an awkward start, losing two wickets with 10 runs on the board. But a magnificent batting display by Suresh Raina and Dinesh Karthik brought GL back into the contest. The pair put on 133 off 72 balls for the third wicket to take the visitors to 143 (13.1 overs) before Raina was run-out by Kagiso Rabada for 77 off 43 balls (five fours and four sixes). Karthik was next to fall just under an over and 15 runs later, after scoring a 34-ball 65 (five fours and five sixes) to steady the ship for GL at 158-4. A swift 19-ball 27 from Aaron Finch got his side close to 190 before he fell to Rabada for the Proteas youngster’s second scalp. DD continued to take wickets, but they could not prevent back-to-back sixes from Ravindra Jadeja (18 off 7), which pushed the Gujarat Lions to 208-7 (20 overs). Pat Cummins and Rabada were the top wicket-takers for DD, with the two speedsters finishing with figures of 2-30 and 2-28 respectively. Samson and Pant helped their side recover after losing an early wicket, as Pant raced to a 27-ball fifty (five sixes, two fours) to take DD to 97-1 (9.0 overs). Samson mirrored his partner to take the Delhi side well past the 100-run mark, smashing seven sixes to take him to his fifty in just 24 balls. The visitors finally got the breakthrough, ending a brutal partnership of 143 as the Daredevils found themselves on 167-2 (13.2 overs). Pant continued to bat exceptionally, adding four more sixes to his tally but the wicketkeeper sadly lost his wicket three runs short of a century, as the home side found themselves on 179-3 with 5.3 overs remaining. Corey Anderson (18 off 12) and Shreyas Iyer (14 off 8) put on a 35-run partnership to take their side home, as DD claimed a seven-wicket victory with 15 balls remaining. Samson won the Stylish Player of the Day award for his 61 off 31 balls, while Pant won the Man of the Match award for his 43-ball 97.